Warner Bros. is using Preview Night to introduce fans to three of their most-anticipated new pilots: The Flash, Constantine, and iZombie. 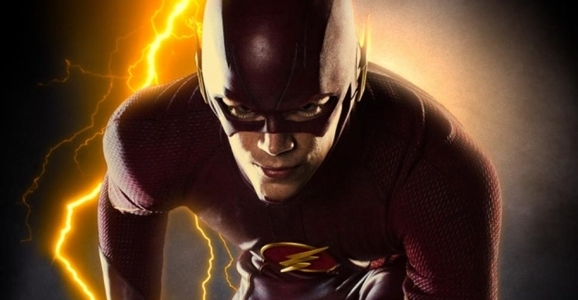 The CW’s The Flash is a spin-off of their hit Arrow, starring Grant Gustin as Barry Allen, a crime-scene investigator who gains super-speed after an accident with a S.T.A.R. Labs supercollider. Unfortunately, there are other people who gained freaky powers the same way, and not all of them are as benevolent as Barry. I’ve seen the pilot and it’s a blast, with some genuinely impressive speed effects and a real sense of what made the best Flash stories so much fun. The pilot was written by executive producers Greg Berlanti and Andrew Kreisberg, along with DC Entertainment’s chief creative officer Geoff Johns. I’ve also seen Constantine, and it’s more of a mixed bag. Actor Matt Ryan does a solid job as morally ambiguous magician (or, as his business card says, “Master of the Dark Arts”) John Constantine, and the show’s got lots of potential. The Constantine character has gone to some very dark places in the pages of Hellblazer over the years, so I’ll be curious to see how much of that material NBC lets the show explore — assuming they don’t just cancel it after two weeks. The show does begin with John voluntarily confined to a mental institution after an incident that will haunt Constantine for the rest of his life, so that’s a good first step. If you make it into the screening, keep an eye out for an Easter egg hinting at another of DC’s supernatural characters. Last but not least, iZombie is based on the Vertigo comic by Chris Roberson and Michael Allred, and the Veronica Mars creator Rob Thomas is showrunner. I haven’t seen either the pilot or the comic, but Thomas’ name guarantees I’ll be tuning in when it premieres midseason on The CW.